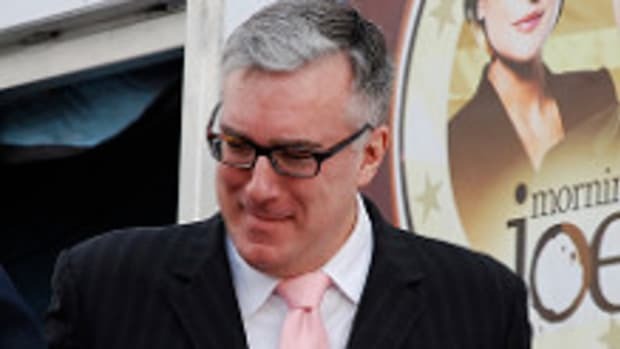 Rather than crawl back on the air and grovel, in his traditional feisty fashion, Keith Olbermann sticks it to his corporate bosses at NBC for their ridiculous dismissal over personal campaign donations. He acknowledged that there should have been a conversation with NBC executives, saying that the donations merited public acknowledgment and perhaps an internal warning. Instead, he said, he was suspended even after one of his representatives was told he would not be, and he learned about the suspension through the media. You should also know that I did not attempt to keep any of these political contributions secret; I knew they would be known to you and the rest of the public. I did not make them through a relative, friend, corporation, PAC, or any other intermediary, and I did not blame them on some kind of convenient ‘mistake’ by their recipients. When a website contacted NBC about one of the donations, I immediately volunteered that there were in fact three of them; and contrary to much of the subsequent reporting, I immediately volunteered to explain all this, on-air and off, in the fashion MSNBC desired. You have to give it up to Olbermann, he really is bigger than the network and one step ahead of the game. In the same way that Michael Moore uses capitalistic greed to promote his message (Viacom indirectly financed his last film because they knew it would be a big hit), Olbermann is doing the exact same with NBC and GE. Both men are so successful and bring in so much revenue that their corporate bosses don&apos;t really care what they say - a rarity in a media culture that encourages political conformity and subservience to its paymasters. Is This Serious? Keith Olbermann Suspended From MSNBC?!?!? Keith Olbermann on Joe Lieberman's Retirement: "Good Riddance"